Alvin’s Contractor Utility Knife features an ergonomic design with anti-slip rubber grips for added safety, comfort, and control. The body is constructed of rugged zinc alloy with a push-button fed, auto-reloading, three-position blade that retracts fully. 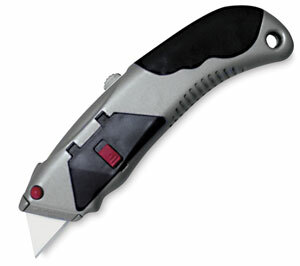 This knife uses standard utility blades (five are included), with a side storage compartment that holds up to 30 blades.